In the late 1940s and early 1950s reconstruction started on many of the sites that had been destroyed by wartime bombing. One of the buildings completed in 1951 was Atlantic House, Holborn Viaduct. This was an easy location to find, but in discovering more about the building I found how in London some things remain the same, and how some buildings are not what they seem. 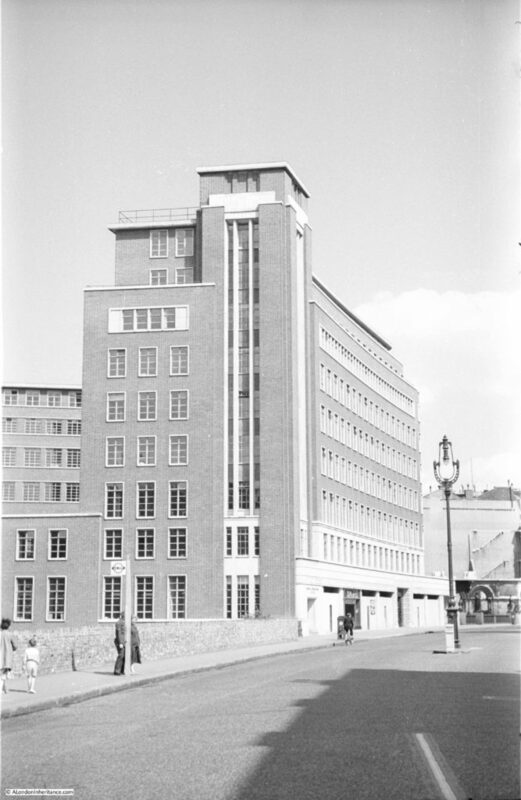 My father took the following photo of Atlantic House in 1951 shortly after completion of the building. 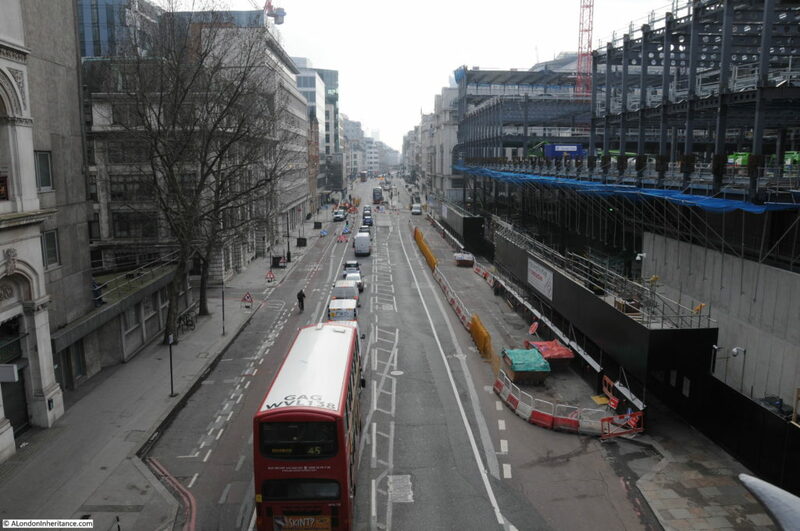 The photo was taken on Holborn Viaduct looking towards Holborn Bridge over Farringdon Street. 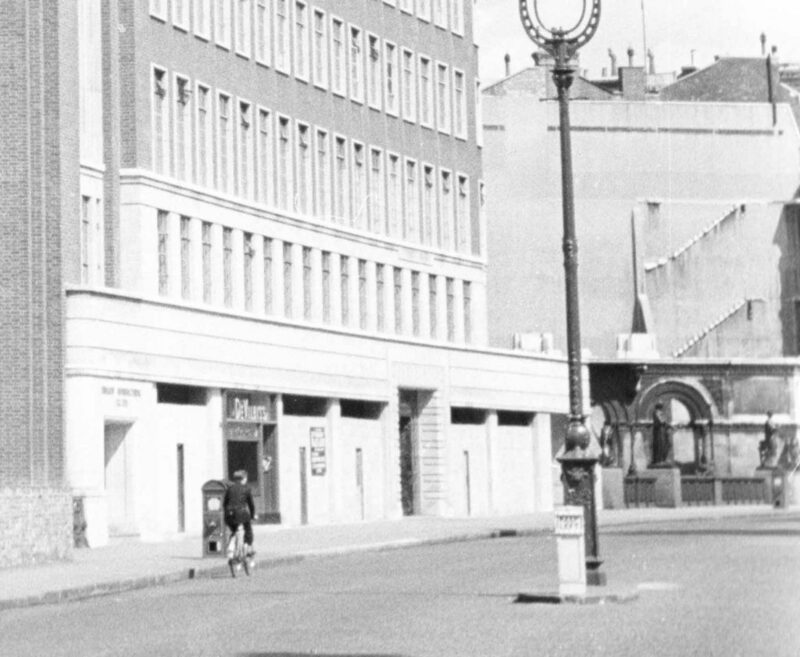 The photo below is an enlargement of part of the above photo and shows the bridge over Farringdon Street to the right of the lamp post with the remains of a building just behind the bridge with the outline of stairs on the adjoining wall. I will come on to the relevance of this building later. This area of London suffered badly during the war as can be seen from the Aerofilms photo below taken in 1951. The photo also demonstrates how random was the impact of bombing with some blocks of buildings completely destroyed whilst others remain untouched. In the photo Atlantic House was still under construction. The building is in the lower left corner. The length along Holborn Viaduct appears complete whilst that along Farringdon Street is still just the steel framework. Atlantic House was design by T.P. Bennett & Son, an architectural practice that is still in existence today. 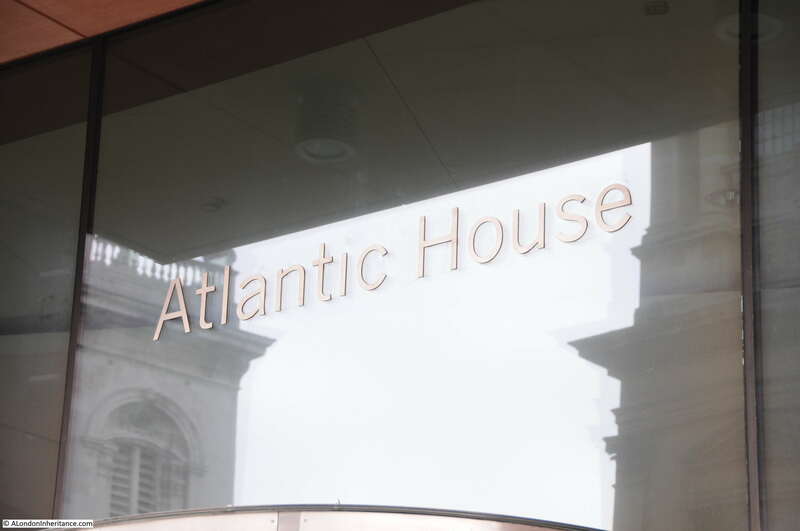 Atlantic House was built under the government’s “lessor scheme”. This was a scheme to try and get post war building underway as there was a considerable shortage of office space across the city. Under the “lessor scheme” office buildings would be leased back to the government for a fixed rate of interest. This provided a cost effective way for the government to get office space built whilst providing a modest return for the construction company. The aim of the “lessor scheme” was to develop office space quickly and cost effectively so there was little incentive for good architecture. Atlantic House was built of steel frame (as seen in the Aerofilms photo) with the frame being clad in brick. 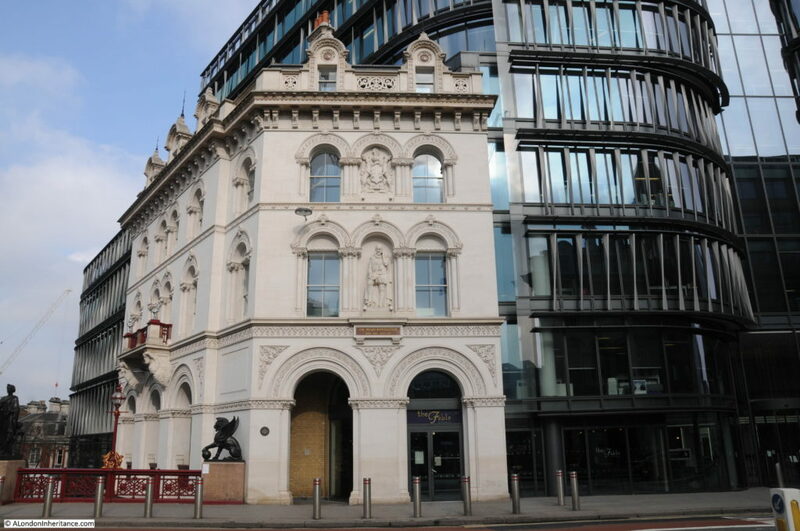 The building had symmetrical frontages on both Holborn Viaduct and Farringdon Street with a curved corner facing onto the bridge over Farringdon Street. The architecture was very much of a 1930s style with long lines of windows along the otherwise plain long facades. It was criticised for its architectural blandness when completed, although I rather like the curved corner of the building. The photo below is from the LMA Collage collection and shows the two long facades and the curved corner facing the bridge. Another Atlantic House, but of a very different architectural style and built of very different materials. Whilst Atlantic House is very different the building on the corner is also new as it does not appear in the photos of the post war Atlantic House. Originally, Holborn Bridge had four pavilions, one on each corner of the bridge. During the war, the two northern pavilions were destroyed by bombing, only the two southern pavilions remained. Go back to the enlargement of my father’s photo and the remains of the north eastern pavilion is the structure seen at the end of the bridge. When the 1951 Atlantic House was built, the remains of the original pavilion were demolished and a concrete stairway built at bridge level to provide access to Farringdon Street below. The original pavilion was not rebuilt. The pavilion that we see on the north west corner today was built after Atlantic House was demolished in 2001. Built to replicate the original, it looks old but is relatively recent. Given that the name Atlantic House is on the building that now occupies the site of the post war Atlantic House, I checked whether there was a pre-war Atlantic House on the same site, and sure enough there was, and I was able to find records of the building dating back to 1901, so there have been three different incarnations of Atlantic House going back for at least 116 years. The current Atlantic House is occupied by a legal services company. 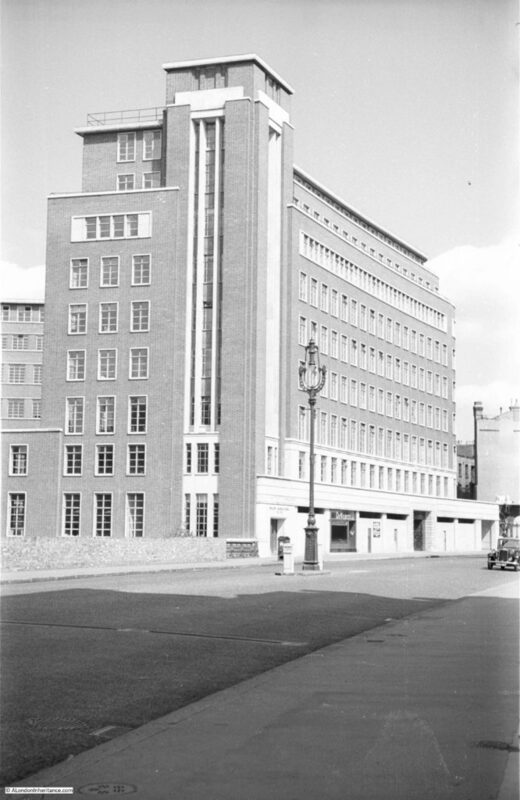 The post war version was the home of Her Majesty’s Stationary Office and the pre- war building appears to have been home to a number of companies including Armour & Co. Ltd, famed for their tinned meats including Armour’s Corned Beef, Armour’s Boned Chicken and Armour’s Ox Tonque which could all be purchased from Harrod’s as well as stores across the country. Another occupant of the pre-war Atlantic House was the Berthon Boat Company, a manufacturer of collapsible boats. Percy K. Langdale, the secretary of the Berthon Boat Company wrote to the Pall Mall Gazette on the 25th April 1912, one of a number of letters concerning the sinking of the Titanic. I have no idea how good the Berthon collapsible boats were, but it does make you wonder how many lifes would have been saved if their boats had been on board the Titanic. On the north east corner of Holborn Bridge, Bath House was built on the site in the 1970s and in 2014, following demolition of Bath House and as part of the redevlopment which included a new Bath House, the final missing pavilion building was constructed. Whilst in the style of the original pavilions, the clean stonework gives away that this is a building only three years of age. The round plaque on the lower left of the pavilion is a City Heritage Award from 2014. The reconstructed pavilions on the north side of Holborn Bridge are rather good replicas of the originals. The photo below shows one of the original pavilions, still standing on the south east corner of Holborn Bridge. Holborn Bridge is part of Holborn Viaduct, the 427m long viaduct designed to provide a bridge over the valley of the Fleet River and a level road between Holborn Circus and Newgate Street. 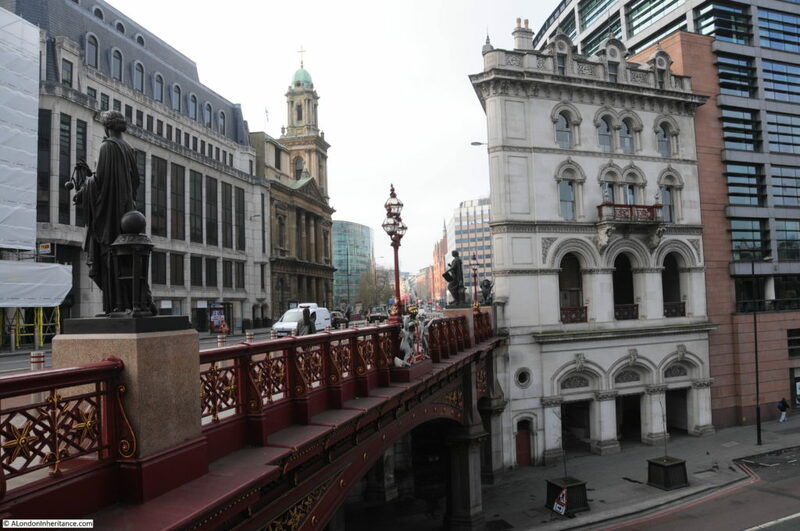 The construction contract for Holborn Viaduct was awarded on the 7th May 1866 and on the 6th November 1869 it was opened by Queen Victoria. Whilst Holborn Bridge is the most obvious part of the Viaduct, there are other places where it can be seen, including the height of the viaduct above the land where it once sloped down, either side of the Fleet River. One such place is the smaller bridge over Shoe Lane. The small bridge over Shoe Lane can also be seen in my father’s photo below, taken from a slightly different angle than the first photo and showing the Shoe Lane Bridge at the lower edge of Atlantic House. 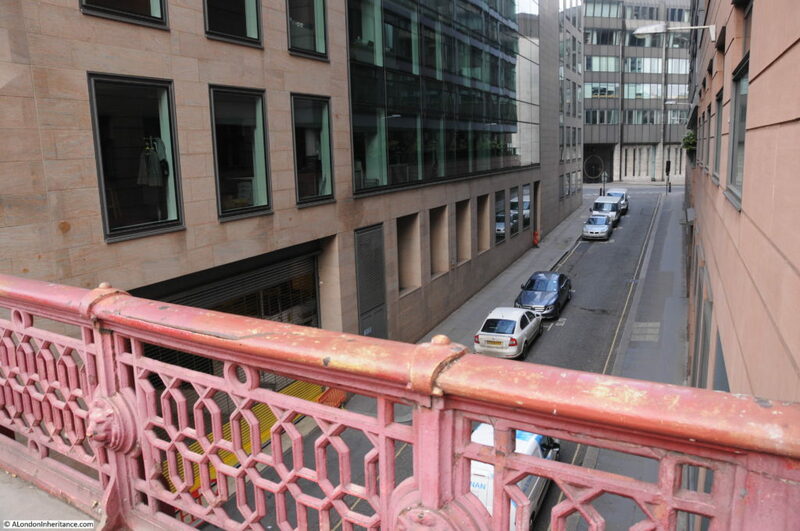 The height of the viaduct can also be seen looking out from Holborn Bridge, south along Farringdon Street down towards the River Thames. As well as the four statues of London Mayors on the pavilion buildings, the bridge also has four statues to Agriculture, Commerce, Fine Art and Science. Each of the pavilions provides a means of getting between Holborn Viaduct and Farringdon Street with a staircase in each pavilion. This was probably their original design purpose, providing access between the two levels via an ornate set of symmetrical buildings at each corner of the bridge. 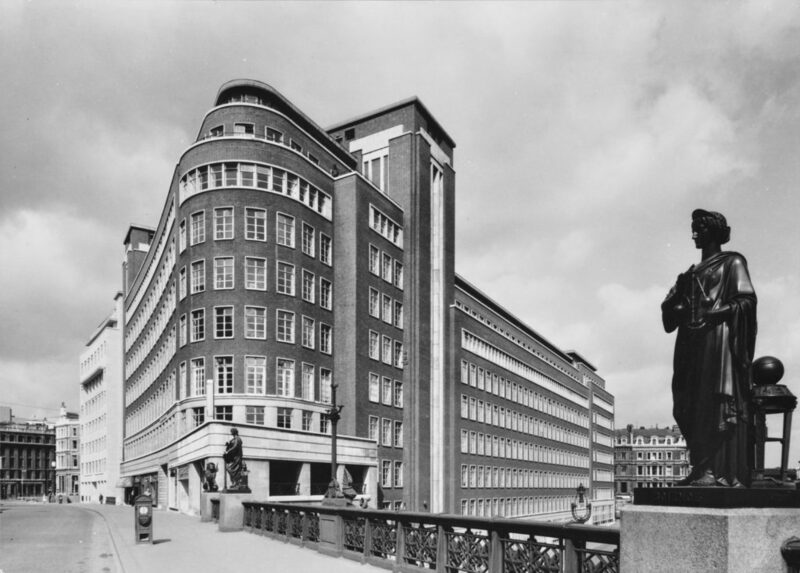 Although the post war Atlantic House did not include rebuilding the pavilion, it did provide a staircase between Holborn Viaduct and Farringdon Street as well as the three windows which look out from the first floor, however it is a very utilitarian concrete structure. In the photo above, the ground floor was occupied by W.B. Poultry & Meats Ltd, one of the many businesses in this area connected with Smithfield Market. 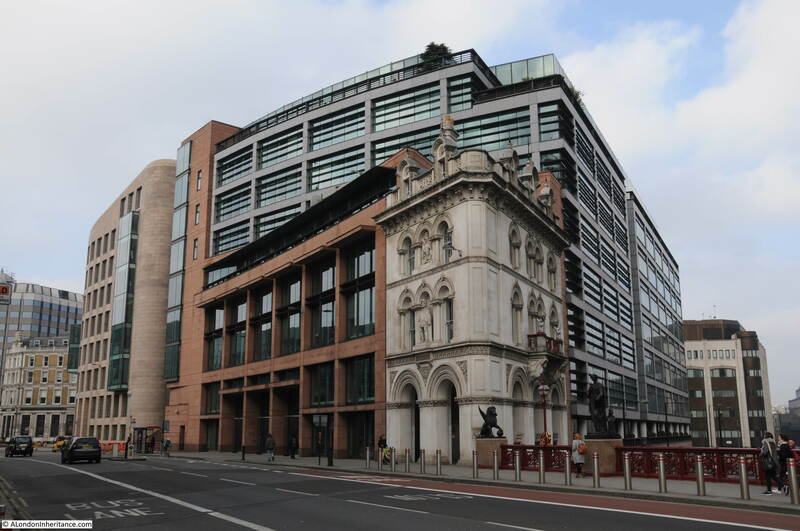 Atlantic House and Holborn Viaduct and Bridge show that despite frequent rebuilding there is some continuity in the names of buildings with Atlantic House being the name for the building on the north west corner of the bridge for over 116 years. They also demonstrate that some things are not quite what they seem with the pavilions on the north side of Holborn Bridge missing for several decades and now being replicas of the originals. This entry was posted in London Buildings and tagged Atlantic House, Holborn, Holborn Viaduct on March 5, 2017 by admin. That was interesting. I have always found Holborn Viaduct a rather chilling place, mostly because it used to be so dirty and ugly. The bombing of the war explains why it appeared rather random. I like Atlantic House and wish it had remained as its replacement is hideous. The gross brutalism of a lot of new London architecture saddens me and you really can tire of endless walls of sheet glass. God knows what it is like to work inside one of them. Fascinating, thank you for the research and excellent photographs. I worked nearby for a few years so remember the location. Fascinating. I sometimes go to meetings in the current Atlantic House and had no idea of the history. Brutalist or not there is a fantastic view to be had from the 11th floor out over Smithfield market and beyond. The creation of Holborn viaduct and the wartime bombing between them totally removed several streets in which my eighteenth century ancestors lived and died. Enjoyed reading this post – I worked in the post-war Atlantic House in the early 1970s, when part of the building was occupied by the Government Social Survey. The GSS, originally part of the wartime Ministry of Information, carried out surveys commissioned by government departments.. We occupied one , possibly two, of the upper floors. I remember the long corridors (no open-plan then) , offices full of natural light, and lovely views across the city rooftops. It was a nice place to work. 1951 and just a solitary bicycle with not a car in sight! Thank you for your dedication and effort in producing these fascinating ‘now & then’ comparisons. I just hope that in another 50 years someone with the same commitment will find your contributions and repeat them for the next generation. Another fine piece of research. With the benefit of being old enough to have witnessed buildings demolished that were built in my life time, the cynic in me wonders how long the present incarnation of Atlantic House will remain. Incredible waste of resources demolishing and rebuilding on such a scale. 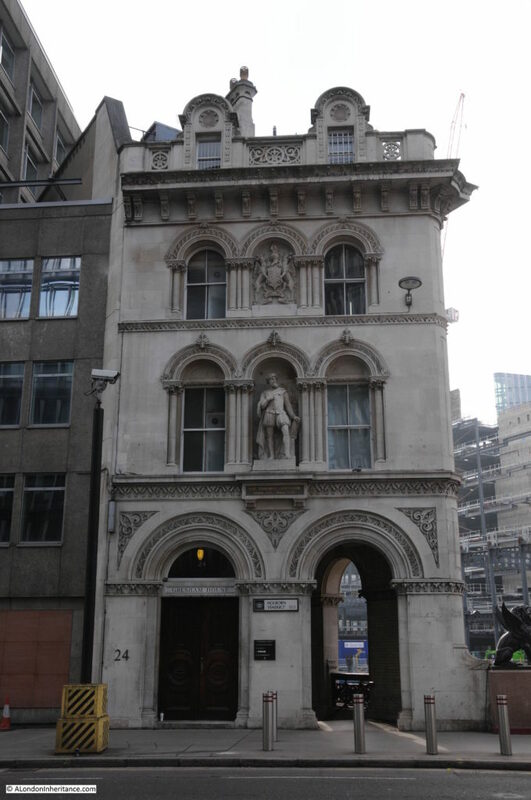 While trying to find a photo of the pre-war Atlantic House, I came across this in the City of London’s Collage site: https://collage.cityoflondon.gov.uk/zoom-item?i=32487. 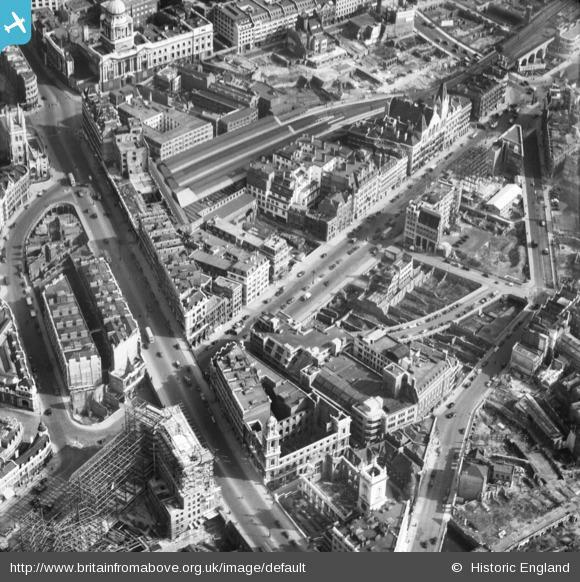 Dating from 1941 it shows bomb damage on Holborn Viaduct. If you zoom in, at the extreme right you can see one of the four pavilions. It must be either the north-west pavilion or the south-east one. In the gap between the two buildings there is what seems to be a waist-high ornate metal railing. This must surely be where Holborn Viaduct goes over Shoe Lane. Hence the building in the right hand half of the photo is the pre-war Atlantic House. Malcolm, that is remarkable. Thanks for finding this. The other points that confirm the location are the lamp post in the middle of the road and the bus stop to the left of the photo. These are in the same position as in my father’s photo, indeed they look the same so perhaps whilst the buildings were demolished these two features survived into the 1950s. It also brings across the level of destruction along Holborn Viaduct. I will check with the LMA to see if I can add this to my post. Thanks again for finding this photo. Fascinating! I much prefer the 1950’s building to the drab modern one, though. Very good post, extremely interesting. Had not realised that both the Northern pavilions were new. PS A couple of minor typo’s “Her Majesty’s Stationary Office” and “Armour’s Ox Tonque”!! Stationary and stationery seems to give people spelling problem. Ex HMSO employee. I came on this image by chance [Holborn viaduct road bridge under construction, 1869.jpg] which I’ll leave in Google Drive for a bit at https://drive.google.com/open?id=0B5HRcpumKwEjcnJBd3ZOZ3lna2s for a while. I can’t orient myself in it, but it shows one of the pavillions. I remember Atlantic House well as it is where we printers used to go if short of work to pick up HMSO orders to keep the presses running. Gosh! What a find. And the advertising hoardings! I’m pretty sure that photo is from the east looking west – the distant church is St Andrew Holborn, and see the curve of the road. The other direction is straighter. Is that tower to the right part of St Selpuchre Without Newgate? So that is the (old) pavilion adjacent to Atlantic House. Not there in 1869 it seems. I suspect there will be a warren on small streets on the Rocque map. I should, more properly, have given a link to the site the photo came from. It can be found at http://www.gettyimages.co.uk/photos/construction-of-holborn-viaduct?excludenudity=true&sort=mostpopular&mediatype=photography&phrase=construction%20of%20holborn%20viaduct – there are several others of the construction and of the pavilions. Such period pieces, and one shows the architect William Haywood. Colin, a fascinating photo, thanks, and as Andrew has identified it is looking from east to west. I also searched using Holborn Viaduct on the LMA Collage site and there are a number of similar photos showing the viaduct being built and the pavilions in various stages of construction. The area’s Ordnance Survey maps for 1896 and 1954 can be viewed online thanks to the National Library of Scotland. They make a fascinating supplement to these photographs and descriptions. The older map is split across the viaduct and shows all four pavilion staircases. How sad it is to see the many instances of “Ruin” on the 1954 map. And how curious to view the complicated run of the municipal boundary, right through the northern end of Atlantic House. Nor does it follow the property lines of the smaller individual buildings shown on that site in 1896. What is that piece of street furniture next to the solitary cyclist? A sand holder for providing grip to the road during icy weather? I worked for the HMSO when I first left school in 1970 tho stationed at Stamford St I would have to visit Atlantic House on numerous duties.great memories. I think Atlantic House would rise in the area to the left, opposite the City Temple. Also notice the block of buildings between St Andrews church and Holborn Circus, now removed. Very interesting. I worked in Atlantic House in 1985/86, on a one year sandwich degree placement with the Office of the Official Receiver who were the then occupants of the building. There was also one floor (out of bounds to OOR staff) which was used by some special undercover branch of the Met Police drugs squad – we used to bump into some rather odd people in the lifts! I loved working there, particularly as it was my first “proper” job, and also the general bustle of the area around Hatton Garden, Farringdon and Smithfield. I have a very soft spot for the building itself. Great views all round, and the office of the actual Official Receiver himself was very plush, in one of the rooms on the corner with the curving windows. There was also a rear entrance onto Charterhouse Street, and it was rumoured that there was an entrance to the Government’s secret tunnels from the basement. There was the top of a staircase down there, with lots of very official looking “Keep Out” signs, but I think it was too far away from the tunnels which did exist further up Holborn to be connected to them. I would also like to thank you for this amazing find. It takes me right back to December 1983 when i was employed right opposite Atlantic House. 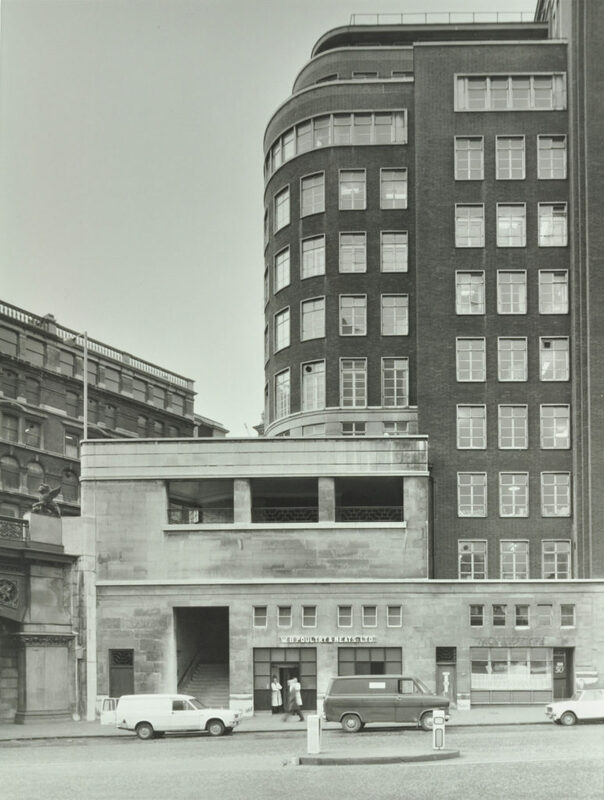 It was at No.25 Holborn Viaduct (Fitz-Elwyn House), the South West Pavilion which survived WWII. I remember Atlantic House vividly and Bath House and feeling ever so excited about working as a 17 year old “Drawing Office Junior” in such an amazing part of London. I too had no idea that there once stood a total of 4 pavilions. Excellent. I worked in HMSO Atlantic House 1965-68. Wonderfully situated to see the best of London.